Edmonton Fringe 2015, What's On? Caws & Effect. Photo credit Chloe Ziner. An interview with Chloe Ziner. Shadow theatre about magical crows. 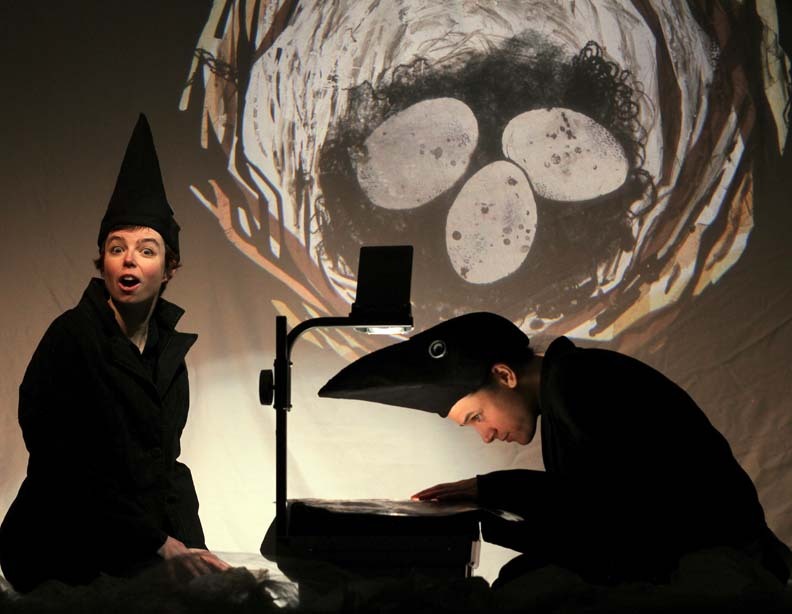 Caws & Effect is a modern fable that explores the unexpected consequences that arise after a crow plants a magical seed. The story is told using handmade layered projections, puppetry, masks, and an original musical score. All aspects of the show are created and performed by the two of us: Chloe Ziner & Jessica Gabriel. People have described our large-scale shadow theatre as quirky and beautiful, almost like an early National Film Board animation performed live. We designed the show for adults, but it’s also good for kids 7+. Why did you choose crows as the form your characters take in Caws & Effect? Crows are fascinating birds. They are intelligent problem-solvers, and I think they are a lot like humans in some ways. We live 5 mins away from the largest crow roost in Vancouver, and every evening we see tens of thousands of crows streaming by in the sky near our house. We observed them and learned their movements so we could create the characters for our show. Often, shadow theatre is performed by puppeteers hidden behind a screen, so you never get to see exactly how it’s done. In Caws & Effect, we perform in front of the screen in character, as crows who are manipulating their world. This lets us connect with the audience in a more direct way, and also gives an extra layer to the story. Your show uses overhead projections. How did you go about conceptualizing and creating the projections that are part of your show? We are both visual artists, musicians, and have trained as clowns. If you put all our art forms into a big cauldron and stirred it up, our unique style of shadow puppetry is what comes out! We first started experimenting with overhead projectors 12 years ago, and they have become one of our main tools for performance. When we build a show, we start with a lot of play and experimentation around a theme, using lights and materials. We’re always looking for a strong image that give us that ‘wow’ feeling. If we are feeling it, then hopefully the audience will too! In Caws & Effect, we decided to use 2 overhead projectors and some flashlights to create layered imagery. After this, we map out the show in storyboard form (like a comic book), incorporating the strong images that we discovered. Next step is crafting and design. Crafting all the pieces takes a long time! We spend months on this step – it’s different then crafting a piece of art to hang on a wall, because we need the puppets & backgrounds to move and have life! If we design the pieces well, then they are easier to manipulate and we can put more expression into them. When all the pieces are crafted, we start running through scenes. This involves a lot of trouble-shooting, improving designs and sometimes re-crafting whole pieces. Finally, we get to the point where we can run the whole show. That’s when we take a video of the show start to finish so we can use it to compose & record the soundtrack. We play every instrument on the soundtrack while watching the video, so this is how we are able to sync together movement and sound so precisely. Finally, when the soundtrack is finished, that’s when we can finally rehearse the show! While performing this show, I’ve realized the finished product is a bit like performing dance, because each move is choreographed to the music. It’s a time-intensive process, but well worth it! We’ve performed Caws & Effect almost 40 times now, and it’s still a joy to be discovering new subtleties in the moves that add life and magic to the show. What themes or ideas does Caws & Effect explore? What do you hope it leaves audiences with? We explore ideas around survival and death in the face of our changing environment. Crows are a lot like humans, in that they also benefit from an urban environment. There are fewer predators and more food sources. We often make decisions based on our desire to survive and flourish, however, there are consequences to every change we make, both good and bad. I hope audiences will feel a whole range of emotion while watching our show- wonder, joy, grief and… a sprinkling of pun appreciation? This show has gotten great reviews and won awards at every Fringe we’ve performed it at so far (Vancouver, Winnipeg, London & Toronto). This is our first time performing in your fine city, so we are looking forward to sharing our quirky art form with you all! Just the two of us: Chloe Ziner & Jessica Gabriel! Our company name is Mind of a Snail and we’re from Vancouver, BC. Caws & Effect Teaser from Mind of a Snail on Vimeo. The 34th Edmonton International Fringe Theatre Festival is August 13 – 23. Get your tickets at tickets.fringetheatre.ca.